Blueprinting is a skill that you definitely need to implement in your business. I blueprint everything in my business—customer service templates, online marketing plans, processes, conversion funnels, releases, hosting setups and much more. If you don’t already, you need to start thinking in terms of process maps, flow charts and blueprints. It’s a very effective way for scaling your business. 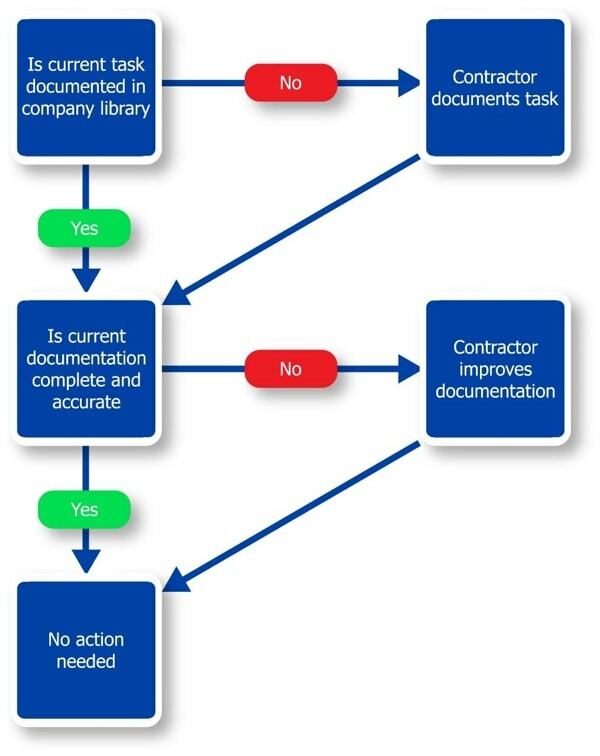 Outsourced contractors and employees need this documentation in order to get up to speed in your business when they are hired. You can develop a process for everything that is done in your business. Yes, it’s a little bit of a pain to do at first, but the great thing is that once a repetitive task is blueprinted, it’s done forever. Then you can effectively hand it off to an outsourced employee with minimal communication. The more details you can include the better. For example, let’s consider the task of having articles written for your site. Here is a sample blueprint of how I would lay out my expectations for an outsourced worker in simple text format. Summary – We are writing articles to attract potential clients. The more quality articles we have on our site and distributed out on the web, the more of an authority we will become to the customer and with search engines. Articles on our site allow for the search engines to index our site for all kinds of long tail keywords that our potential customers are searching for. Articles posted on other sites allow us to introduce our business to new potential customers. We need to make sure that the articles are written around a “keyword” that we are targeting, and the articles need to include very in-depth, and researched information. No “fluff”. Put yourself in the user’s shoes. Your goal is to write an article that they will share with all their facebook friends or actually post on their own site. You can find the keywords we are targeting in the “keyword research” document in Basecamp (these are all the topics that you can write on). Write the article as if we are trying to help the end user solve a very specific problem and actually teach them how to solve that problem. Ideally we’d like to include one image per article. Sample – Link here to a publically accessible finished article on Google docs or even anywhere on the web. You don’t have to own the article that you use as a sample. Distribution – When the article is completed, please upload it to Basecamp. Ok, now that I have the “blueprint” for article creation, it’s simply a matter of finding the correct writers to pump out the articles. I can now create my own little writing “factory”. I could have 1000 articles written by 50-100 different outsourced writers and I would pretty much get the results that I was looking for. I’d have to refine the process, promote certain writers and fire others. But there should be no question on what needs to be done. I’ve outlined all the topics, I’ve provided samples, I’ve told them how many words, how many to write, why they are writing the articles and more. The point is this… Invest the time up front. Document the process. Teach the worker. Invest in them. Then enjoy the results of having a good process versus just telling the worker to “write articles.” If you just tell them to “write articles” you’d be getting articles of all different lengths, without any standard flow at all. It would be a mess. You’d spend more money, and you’d invest a lot of time in redoing a lot of the work. Invest the time up front and your outsourcing will be much more successful. When you look at your business from a high level, you want to have everything blueprinted. This section will describe the various types of blueprints that you’ll be creating. There are several benefits of creating the blueprints. Part of it is just for your own reference. You have a good idea, or you are doing a new task. Simply blueprinting it and storing it in a location you can easily access will put it in a memory bank that will always exist. This reduces your stress levels. Now, that you’ve identified the general people that will be using the blueprints, it’s much easier to figure out the actual blueprints that need to be created, the formats that make the most sense, and which to attack first. Internal Business Processes – These are mostly used by managers and owners. They include your process for hiring, managing people, paying employees, paying commissions to affiliates, and more. These are all the repetitive tasks that managers in your business need to perform on a recurring basis. They provide a foundation for your business so that if a manager or any other high-level employee leaves, another person is easily able to perform these tasks. Tasks – These are mostly performed by the employees in your organization on a recurring basis. They are things like writing articles, building links, answering the phone, responding to refunds, calling on customers, and more. So let’s take the example of calling on customers. You’d have two or more maps for this. You would have one map that included the script, the purpose, the goal, frequency, etc… This would be the map that you would give to your employee and is the task. But then you’d need to have another map for the managers in your organization that was an internal map that included items like where your customers were stored, who to call when, and how to add a new contact. When you start blueprinting you’ll realize that what you are really doing is recording your ideas. You’ll start to see that there are many different formats for doing so, and that certain formats make sense for different situations, depending on what you are trying to get across. Flowcharts – This is my preferred method of recording ideas. The reason for this is because they are quick to produce, include text for a way to get your ideas across, but most importantly they provide a step-by-step plan for accomplishing the desired action. They allow the viewer to quickly see the steps associated with any process or task. Flowcharts work really well when you need to explain something from a high level and there are not a ton of details. Text / Written – This format is good when you have more “theory” to explain and there is no specific step-by-step process needed. This also works well for requirement documentation. In the earlier example of the “article writing process”, text was a natural fit because we were just trying to get the general requirements communicated. This format works very well when you need to explain something in depth. Mindmaps – This format is good when you are brainstorming and building the general plan of attack for a very high level topic with few details needed. A mindmap would work well, for example, if you were considering a new product and how to infiltrate the market. While text maps and flowcharts generally cover one topic or one specific process, mindmaps allow you to include several topics in one map. For example, you could have marketing, development and strategy all in the same document. Mindmaps are very similar to flowcharts but they are interactive and not static, while flowcharts are a more static solution. Also mindmaps don’t require the step-by-step flow that flowcharts do. Video – This format is good when you need to explain something in extensive detail. Video is great because the viewer can understand your “tone” and emphasis. In general, the preferred type of video to use is screencast where the viewer can hear your voice and see your mouse clicks. This is literally like having someone standing over your shoulder while you show them something. Video has some major downsides that need to be considered though. First, changes are very hard to make. So if part of your process changes, they need to be updated, and that is a time consuming process. Second, it’s not easy for someone to quickly see your process. They instead have to spend the 10 – 15 minutes to watch the video. In general, I suggest starting with flowcharts and text documentation because these formats are extremely easy to change, they communicate the points very quickly and they are easy to produce. We’ve discussed the specific types of blueprints, the formats, and why you need to start using them, let’s now learn the technology tools that will help you create the blueprints. Google Documents – This is the Google version of a word processor. It’s on the cloud but you can also read and create docs offline (without internet access). The really cool part about Google docs is that you can collaborate with others, so if a change comes up in a process your team member can simply make the change, and it’s saved automatically. Google docs also have a great revision history, so there’s no need to worry about someone overwriting your work, etc… you can always just revert back to a previous version. Google docs are great for text based maps. The other thing that I really like about Google drive (where docs exists) is that it syncs automatically to your machine. It will accept multiple file types including pdf, images, word, spreadsheets, and more. Finally, it uses the typical folder style organization. So you can have a folder for all your marketing blueprints, and a different folder for all your development blueprints. You can grant access to various people accordingly. This is a really slick system. Google Drawing – This is what I use to create flowcharts. It’s a Google Drive service and completely free. I’ve tried several other systems as well, but I am moving more and more towards “cloud” based services because they are accessible on all of my machines through a browser. Google drawing has a lot of features, but not enough to become confusing. Smartdraw – This is a desktop based flowchart software platform. Much more in-depth if you prefer that. It’s fast and simple. Mindjet – This is a desktop based mindmapping platform and they also have a web-based version for $15 / month. Mindjet is far and away the leader in this space and their software integrates with many other formats. Dropbox – Dropbox is awesome service. I have all files on Dropbox and pay for their 200GB option. It’s similar to Google drive, but Dropbox does not have their own file formats. For pictures, videos, word docs, spreadsheets, videos, etc… it doesn’t get any better than Dropbox. The cool thing about dropbox is it’s collaboration functionality. You can share specific folders with various people and when they update a file it’s shared to your dropbox locally and on the cloud. Dropbox also has revision history. I prefer Dropbox to Google Drive, but it’s nice to have the cloud based file formats that Google offers. I use both services all day every day. Basecamp – This service allows you to upload files and permit access to specific team members. They do charge based on storage levels. You’ll want to set up a specific project called “training” or similar. You can also use their writeboard feature to collaborate with your team. Camtasia/ Screencast.com – These are the services that I use to record videos of my screen for documentation purposes. Screencast is free, and Camtasia is $299. The major difference is that Camtasia is a full featured editing suite while screencast doesn’t have editing abilities. There are hundreds of other tools available for use. It just depends on what you prefer. The above tools are the ones that I find the most efficient, but in the end, getting started is what really matters. Many entrepreneurs and business owners get caught up doing the same task over and over. It’s tempting to think that this particular task is too hard, too complex, requires too much thought, or is just too important to hand off to someone else. I’ve been caught in this trap before, and it’s a hard one to get out of. We all have our morning routines (or whatever time in the day you perform your routine tasks). Many times before we realize it, the day has gotten away from us because of our “routine” tasks. We can get out of this trap though by having solid documentation of our processes. The goal of this section is for your organization to start blueprinting it’s tasks and uploading this documentation to a shared access point where everyone on your team can access. Get a subscription to Basecamp, or an alternative. You even can use Google sites. Use anything that requires a login and will allow you to upload files and grant access to certain users. Once you get your subscription live, start a little section or project called “training and documentation.” This now becomes your employee training area. Use it. It will be extremely valuable as you build your team. You should never personally do a process more than four times unless it’s something that is absolutely related to your core competency. Instead of doing a task over and over again, here’s the process that I’ve implemented into my own businesses. Step 2 – Do the repetitive task and record it in your preferred format. Step 3 – Give the file a descriptive name. Step 4 – Upload to the “training and documentation” section of your collaboration app. Step 5 – Make this task a portion of someone else’s daily, weekly or monthly job depending on the frequency required. Now you have the task documented, assigned to someone you trust, and have one less thing to worry about. It’s as simple as that. Move your business forward one outsourced task at a time. This takes determination and a lot of patience. Many times it’s easier just to get the task done yourself, but you need to bring yourself back to strategy and taking action on those pieces of your business that really move it forward. In no time at all, you’ll have a complete library of training documents for your organization. Peter Drucker coined the phrase “knowledge worker.” During the industrial revolution it was much easier to manage employees. Employee 1 gets 10 units done, Employee 2 gets 11 units done, and employee 3 gets 3 units done. It’s very easy to spot problems. But now most of us manage “knowledge workers.” Their progress is harder to define. It’s more intangible in nature. A “knowledge worker” for example is a webmaster. The first issue is that the webmaster typically holds a skill set that “the manager” doesn’t have. Second, it’s not nearly as easy to “measure” a webmaster as it is a factory worker. He’s writing code, maintaining servers, and managing traffic. Totally different than what we had back in the industrial revolution. What the typical business has now is a bunch of employees in front of their computers doing “virtual” work. How do we measure it? Well, we start by defining a standard set of projects that the “webmaster” should be working on. You want to have as much clarity (on both sides) on the webmaster’s role as possible. And if they deviate from the tasks agreed on? If they deviate and are forced to work on a project that has not yet been defined, the webmaster simply defines the project. You (the manager) see this, and you can decide if this something that he shouldn’t be working on, or if it should now be added to the webmaster’s job description. Either way, it’s captured and documented. It’s a way for you to build automatic job descriptions. You get to see where your employees are “really” spending their time and adjust accordingly. Now you can use several different automated solutions for this process that we discussed above in the time tracking section. But the important part to realize is that your employees are probably doing 50 things outside of their specific job functions. We don’t always know how they spend their time. Sometimes a utility player that you want to be working mostly on marketing tasks is really spending 75% of their time on customer support, and other times they are working on tasks that need to be done that you don’t even know about. So it’s important that you discover what they are really doing with their time and documenting the tasks that they are creating on a daily basis. It’s your job as a manager of a business to have a handle on all of this.